In the medieval West, painting on panel had not been especially common. Mosaic and fresco predominated in the decoration of churches; relics, not images, were the greatest focus of devotion. Nor were panel paintings especially sought by wealthy private patrons, who favored more luxurious objects such as tapestries and richly illuminated manuscripts. Icons arriving from the East, which gave new value to the painted image, helped shape the future of painting in the West. Icons flooded into Italy after 1204, following the ruinous Fourth Crusade, when Western armies sacked Constantinople. Like the many relics stolen from the Byzantine capital, icons were seized for the protection they were thought to afford, their power to effect miracles, and the prestige that ancient and venerated objects conveyed on those who held them. In Rome the most important icons frequently came under direct control of the pope. Greek artists seeking more peaceful conditions and new markets to replace those that had collapsed at home also went to Italy in increasing numbers. The presence there of Greek painters—together with the great authority of imported icons—spurred Italian artists toward panel painting as an art form and toward the sophistication of Byzantine subjects and style. Some later commentators (like the Florentine Vasari) would disparage the maniera greca, but the new fusion of East and West energized art at the end of the Middle Ages. This panel blends Byzantine and Western elements. 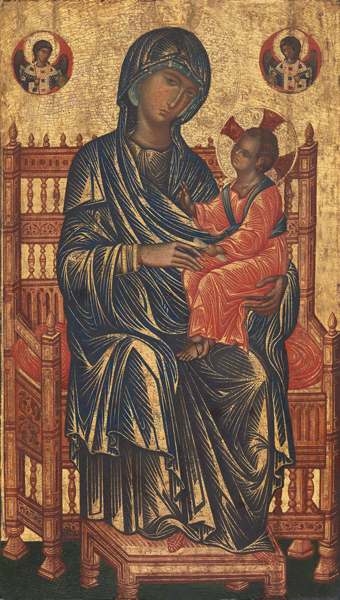 The Virgin’s pose is loosely modeled on the Hodegetria, and the gold background and highlights in her robe also recall Byzantine models. 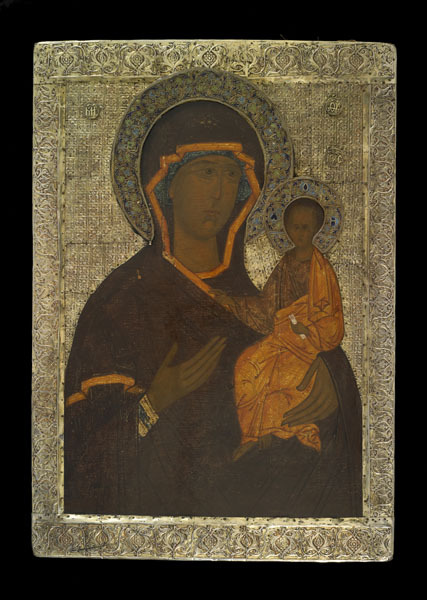 But it was probably made by a Greek icon painter who was working in Italy or at least for an Italian patron. Jesus gives the Western, not Eastern, form of blessing, and the haloes—unlike the plain burnished disks seen in Byzantine art—are punched with floral patterns, such as those found in Western paintings. 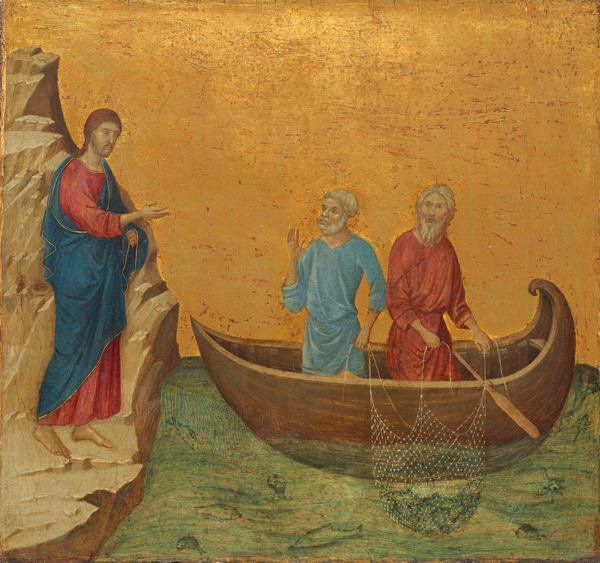 The arrival in the West of panel paintings in the Byzantine tradition coincided with changes in the display of relics, church architecture, and the liturgy, all of which promoted the development of a new art form—the altarpiece. Appearing for the first time in Italy in the thirteenth century, it came to dominate both church and private commissions across Europe. Early altars, often built over the tombs of martyrs, had been centered on the display of relics, and priests had performed the Mass from behind the altar, facing the congregation. A change in the liturgy, which moved priests to stand in front of and facing the altar, opened a new space for the display of large altarpieces. In Italy most were constructed of multiple painted panels (see Time and Narrative). Now, beginning in the thirteenth century, images, not relics, became the center of Christian devotion. 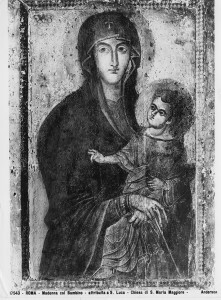 The status of icons, poised between relic and image, contributed to the greater attention and prestige given paintings in the West. Ancient images like the Saluswere often placed above altars. Paintings on panel were accessible in a way that large-scale and site-specific works in mosaic or fresco could never be—they were smaller and portable. They could be owned by individuals and used for private devotions in the home. 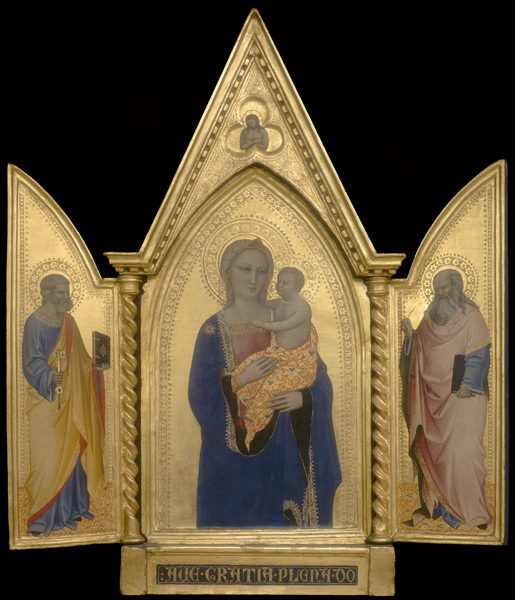 This small version of a church altarpiece was used for private devotion in the home. It could have been purchased from stock or commissioned. Nardo and his brothers Andrea and Jacopo (called Orcagna) had Florence’s busiest workshop in the late 1300s. Most of the early Renaissance religious scenes found in museums today were originally parts of altarpieces. These two panels were among the more than fifty by Duccio that were once part of the Maestà, the magnificent altarpiece in Siena’s cathedral. 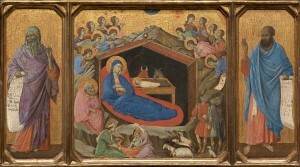 Duccio blended Byzantine and other influences. 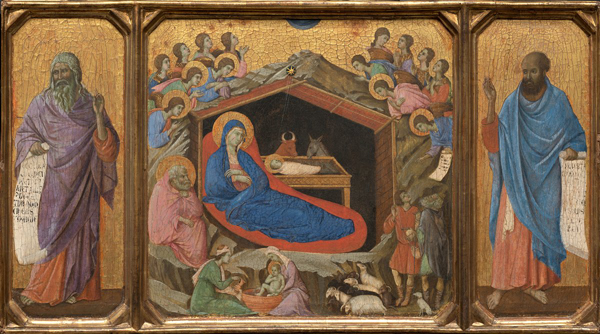 His setting of the Nativity in a cave, for example, is a Byzantine tradition, but his brushwork and flowing line soften the austerity of his Byzantine models.